Contrary to the propaganda you might hear from the Australian Meat and Lifestock Association, an appropriately planned, well-balanced vegetarian diet is compatible with an adequate iron status. Vegetarians should choose high iron foods like whole grains, legumes, tofu, panir cheese, and green leafy vegetables daily and consume them with foods rich in vitamin C to increase the bioavailability of the iron. Dal is a perfect and inexpensive way of providing easy-to-absorb iron. 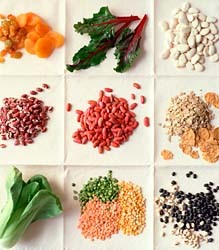 For instance, mung beans are rich in vegetable protein, iron, and B vitamins. When you combine dal with a food that has a complimentary protein (grains, seeds, nuts, or milk products), the usable protein in the dal increases. A squeeze of lemon makes the iron even more accessible, and rounds out the flavours wonderfully. By the way, bananas are high in iron, and can stimulate the production of heamoglobin in the blood and help in cases of anemia. And of course, the famous khichari is a delectable source of iron. For lots more very interesting and practical information about iron and a vegetarian diet, click here.